Looking for a dreamy and unique spot for your honeymoon adventure? Morocco may be just the place! On the most Southern tip of the African continent lies one of the most aromatic and dreamiest countries of all: Morocco. It borders the Atlantic Ocean and the Mediterranean sea and offers honeymooners a thoroughly immersion into the diverse culture that includes Berber, Arabian and European influences. This hot climate features an eccentric and eclectic city life, a political climate that’s continuously changing, and vast amount sandy dune and mountains, where a camel can quite literally carry you into the sunset. 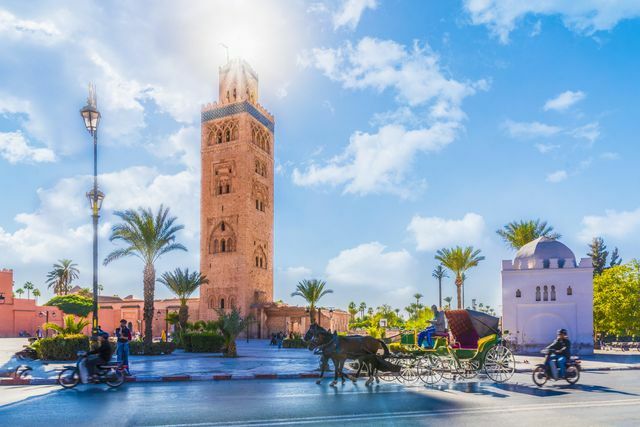 For those couples who seek intrigue for their first trip as newlyweds, this country is the most accessible in North Africa from Europe and North America. Pack your billowy clothes, a scarf to hold back your locks, some sunglasses and plenty of sunscreen and prepare yourself for a seductive Morocco honeymoon, fit for two. 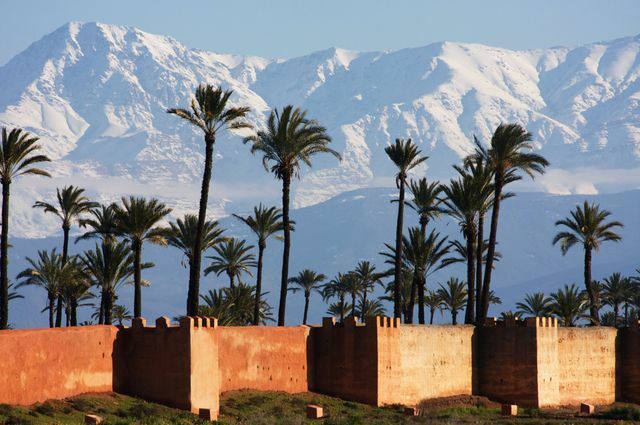 Morocco features year-round warm temperatures, making it an ideal excursion from frigid degrees that lurk in the North. Even so, some seasons are better than others, with most travel experts recommending spring time—from March to May—as the quintessential time to tour around. During these months, you’ll witness flowers blooming throughout the cities and gardens, and clear, blue and comfortable skies. Summer is still an okay time to visit, but consider yourself warned that it will be toasty: since shade is difficult to find in the middle of a desert. Another option if you’re unavailable earlier in the year is Autumn—from September to November—when the humidity has waived. Overall, much of Morocco is inexpensive or affordable, but during the fall and winter, you’ll be able to snag off-season rates when you stay in a traditional riad. There’s something mesmerizing about Marrakech, right from the moment you land. Whether you’re winding through the maze of the medina—where local goods, tourist shops, bakeries and butchers all fight for your attention—or wandering through the old town walls, searching for the mysteries that lie in their foundation, you’ll find yourself dazzled by the chaos. Here, it is recommended to always stick together, since pickpocketing is a concern. Women should make an effort to cover up their arms and décolletage areas to avoid unwarranted or unwanted attention—and as a sign of respect for the mostly Muslim country. Look into many of the upscale riads located in the media, where you can experience an upgraded view of the traditional Moroccan home, and savor the privacy and ability to sport a bathing suit. Keep in mind this country is dry—but some speakeasies exist. Do you research and try to be respectful. Word to the wise? A lack of traffic lights makes it difficult to know when you’re meant to walk, so take a page out of an experienced nomad’s playbook and follow the locals! No Moroccan honeymoon is complete without a trip to the Sahara Desert. With countless tours leaving and returning from Marrakesh, reserve at least two to three days of sleeping under the myriad of stars. Because it is at least an eight-hour drive out—with many tours spanning up to 12—you might enjoy a longer period, so you can make stops along the way to local towns and UNESCO World Heritage stops that are sprinkled about the road. Those who experience car sickness should be mindful and bring medicine, since the journey is far from straight. If you’re wondering if the extra cost of glamping, riding camels and sandboarding is worth it? It 100 percent is. For an unforgettable way to greet a morning as newlyweds, get up early and grab a cup of ‘Moroccan whiskey’ (that’s coffee! ), and climb a sundune to watch the sunrise. If you’ve never heard of this town, consider its more common touristy nickname: the Blue City. It’s an appropriate moniker since many of the buildings, streets and tiles are, well, blue! Here, you’ll find yourself lost through small streets and washed buildings, featuring ample opportunity to shop locally and dine on local fare, like tajine. 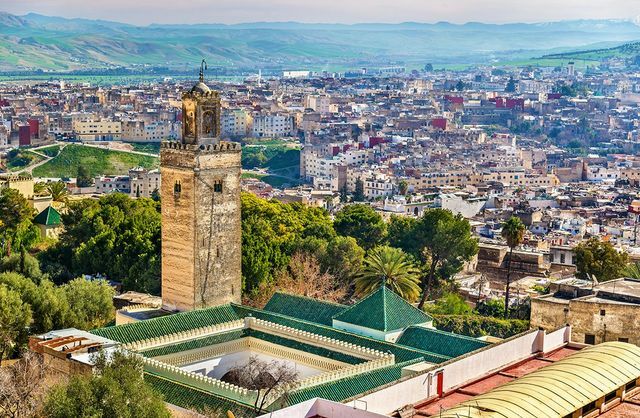 Make sure to book a suite near the main square—Place Outa el Hammam—where you’ll have views of the color-contrasting Kasbah, a red 15th-century dungeon and fortress. Consider your stint hear a relaxing one, since it oozes with romance—and begs to be Instagrammed. Ask anyone who has spent time in Morocco and they’ll sing the praises of this little-known destination. In the northeast, it is often considered the culture capital of the country, with vibrant experiences aplenty. Here, you can explore through their large medina, Fes El Bali, which is confined from the rest of the city. 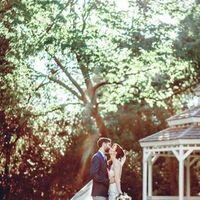 After you stock up on a suitcase worth of fine goods and artisan creations, venture through the many historic buildings and restaurants, where you’ll have the opportunity to celebrate your love in a unique way.